This text uses a holistic approach to show how schools, families, and community agencies can build partnerships to reduce school violence. 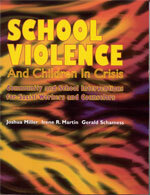 The book examines various theoretical perspectives to facilitate understanding of the etiology and consequences of school, family, and community violence. The authors cover crisis teams, teacher interventions, debriefing, group psychotherapy, and building partnerships for success. The final part of this text presents community interventions, suggesting that community-based clinical social workers take leadership in collaborations to build systems of care. This effective resource provides practical insight into the emerging culture of violence in our schools and is specially designed to help school social workers, counselors, and community leaders address this critical issue.